Providing a comfortable work environment is one of the most important concerns for every business. People don’t perform at their best if they are in an uncomfortable building, leading to a drain on company morale. That is why more and more architects and engineers are consider the natural roof ventilator for their commercial buildings. What is a Roof Ventilator? Roof ventilation is the most important part any Natural Ventilation system. It utilizes natural forces of gravity and air pressure to move air though a space and improve the building’s internal air quality. Many designs utilize roof ventilators in conjunction with wall ventilators for intake air. On the other hand powered wall fans may be used in a Pressure Gravity System®. Natural roof ventilator devices comes in all shapes and sizes. There are massive industrial ventilators like the MoffittVent™ and Labyrinth for heavy industry environments. High-heat areas like mills, smelters, and kilns are ideal for these products.. They exhaust large volumes of air and are vital for temperature control. For more moderate sized buildings, like university spaces, office buildings, and commercial spaces, smaller architectural daylight ventilators like the Apollo and Kameleon natural casement ventilator are used. Heavy commercial and light industrial environments utilize these vents as well. However, their sleek, modern looking design makes them ideal for highly engineered buildings. 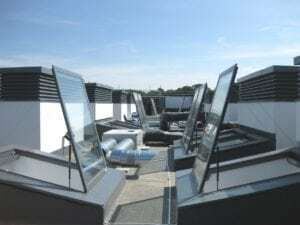 Unlike traditional air conditioning, which can be expensive, unreliable, and environmentally-unfriendly, Natural Ventilation is literally, a breath of fresh air. Instead of stale recirculated air, wall and roof ventilators bring cool, clean air into the building. In conclusion, this air is better for the building’s occupants and improves the state of your building.